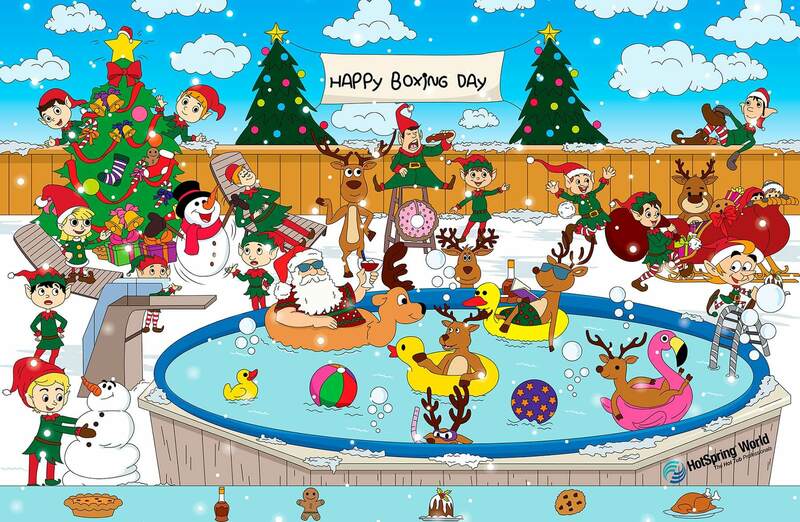 Hot Tub Christmas Party: Can you Find the Hidden Objects? After a successful Christmas day, Santa and his elves are letting their hair down with a well deserved hot tub party. However, it seems as though the party is not going swimmingly (if you’ll pardon the pun). One of the cheeky elves has gone and hidden some of the festive treats! Everyone is ready to get the party started, so can you help Santa find his missing food and drink? There are six missing treats in total – how long will it take for you to spot them all? On average, it took the Hotspring World staff 1 minute and 21 seconds to find them all – just enough time to listen to the classic Joy to the World by Nat King Cole. How long will it take you? Christmas and Hot tubs can go hand in hand! Hot Tub festivities can be enjoyed all year round, with a hot tub you can celebrate in style whatever the weather, there is nothing quite like staring up at the stars on a cold night while you relax in the warm bubbling water. Likewise, hot tubs aren’t just for relaxing. Hosting a Christmas hot tub party is a great alternative to a traditional Christmas soireé. Simply stock up on extra towels, compile a playlist, gather some food and drink and fire up the tub. You’ll be hosting an epic Christmas party before you know it – just like Santa and his friends!